I was looking forward to today's Turkey Trot for a number of reasons. 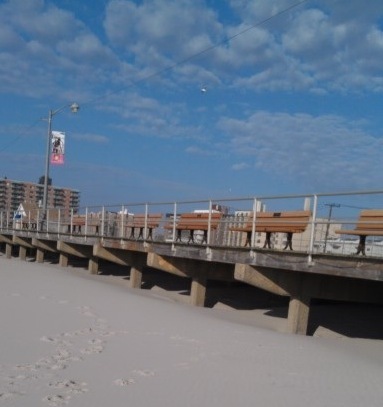 First, Long Beach, with its boardwalk, beach views and small city charm, is a great place to run. Secondly, the organizers of these Long Beach races put on great events that seem low key, but are actually supported by the actions of many. The third reason I looked forward to this Turkey Trot is that last year's race was my fastest 10K to date, and I was hoping to improve on that. I'm pleased to report that I have a new 10K PR, finishing with a time of 54:35. This is almost a minute faster than my current personal best for that distance. 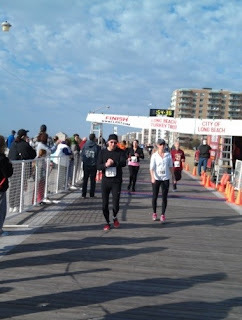 It's interesting to note that while the average pace of my typical training runs has slowed since last year, I achieved best-ever times on five of my annual races in 2011: the New Hyde Park 8K, Dirty Sock 10K, Great Cow Harbor 10K, Run for the Warriors 10K and today's Long Beach 10K. The temperature this morning was a mild 53° when Team Emerging Runner arrived in Long Beach. I picked up my race number and noted that the stiff winds coming off the ocean were making it feel far colder. I had a long sleeve jersey over my intended short sleeve race shirt but we ducked behind the stage and I did a quick swap. Those brief seconds when I was without a shirt were mighty chilly. I wore a winter jacket as we waited for the start and it kept me quite comfortable. I saw many runners who seemed fine wearing short sleeves and running shorts but that wouldn't have worked for me. We watched the start and finish of the 1-mile race that precedes the 10K. This race is for kids, and it was won by a 15 year old boy who came over the line in 5:34. Soon it was time to line up for my race so I handed off my jacket to my son and hoped not to freeze in the 10 minutes before the starting horn. Since I was wearing all black in direct sunlight and the people behind me were blocking the wind, I felt fine. I sized up my competition near the front of the line and, as usual, I felt like I was among a fast crowd. Unlike last year, I knew not to be concerned by the droves of faster runners that might fly by me in the first few minutes. The race started and we were off. The hundreds of runners pounding the boardwalk made quite a racket. I waved to my family as I passed by and then focused on my form and pace. Last year I ran the first mile in 8:05. I didn't want to run that pace so close to the start because I had a lot more race to run. I stayed with the pack and passed the first mile at 8:15. Still a little too fast, but I felt okay. We were off the boardwalk at this point, still heading east, and as we reached the turnaround on Broadway someone yelled, "Here comes the wind!" He wasn't kidding, the southeastern wind hit us full in the face and I realized that this wind would be present for much of the race. It really wasn't that bad and as I heated up, I appreciated the cooling effect. I decided to run as hard as I could for as long as I could, thinking I could slow down later if necessary. It took longer to reach 3 miles than I'd hoped and I passed the 5K sensor in 27:45. I actually ran a negative split for the second 5K. I took a Roctane gel shortly after that and soon we were running parallel to the water on the northern side of Long Beach. I was still feeling strong and was maintaining good form. I was glad that I'd run this race last year because I knew what lay ahead. I watched the ocean's horizon as we ran south and soon after passing the 4-mile marker it was time to turn west. We soon reached the street that would lead us back to the boardwalk. After a quick scramble up the ramp where I jockeyed for position in this narrow section, I was back on the boardwalk that would lead me to the finish line. Unfortunately it wasn't that simple, and I recalled that last year's final run on the boardwalk seemed to take forever. I was still running well and finally saw the 5-mile marker, so I knew that I had 1.2 miles left to go. Like last year, this seemed to be the place where many runners pulled out all stops and ran the last mile as fast as they could. I got passed by at least six runners but I couldn't generate the leg turnover required to hold them off. Instead I focused on getting to the end. Where the heck was the finish line?! As I knew it would, the finish chute finally became visible with about 500 feet to go. I put every effort into this final sprint, and as I got closer to the race clock, I realized I might break 55 minutes for the first time. I came over the line in 54:35 with my wife, son and daughter cheering me in with fist bumps. I felt drained but I still had some strength. I ran a good race. Unlike last weekend's 10K, when I surprised myself by running a decent time, I had higher expectations for today. I had hoped for a similar performance at this year's race but I beat my own expectation handily. 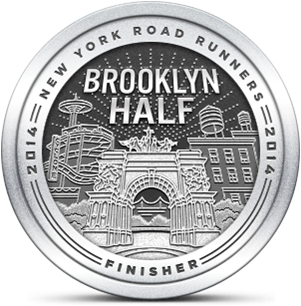 I plan to run one more race this year in December, probably a 5K or a 4-mile race that I'll do mostly for fun. My biggest performance target this year was today's Long Beach 10K and I'm pleased with how that turned out.